A few of my customers recently have been hit by the decluttering bug and have been inspired by my blog Declutter your office and your business. There are a few times in the year when it seems to hit people – September, end of the year going into the new year and Spring time. It always gets me towards the end of the year, looking back and wanting to clear excess before the start of the new year. I do it in my home in general but it’s especially nice in the office where I inevitably spend much of my day. 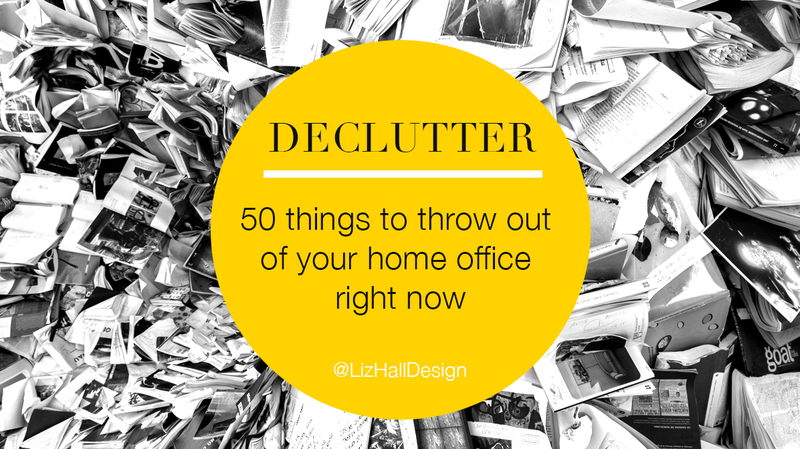 If you’re keen to declutter but you’re struggling to know where to start or you just want a quick clear out of excess items, I’ve put together a list of 50 things you can throw out of your office right now. It’s a mix of actual physical things plus digital clutter as every thing seems to pile up in rooms, on computers and on phones. But as before, please don’t just throw away. Where possible, try to recycle, upcycle, take to charity, gift to others. Now that you have a sparkling, tidy office, have a peek at my blog 8 easy ways to create a happier, healthier workspace. Now that all the excess clutter is gone, you can concentrate on creating yourself a workspace you absolutely love and you actually want to spend time in. Can you think of anything else to add to the list above?